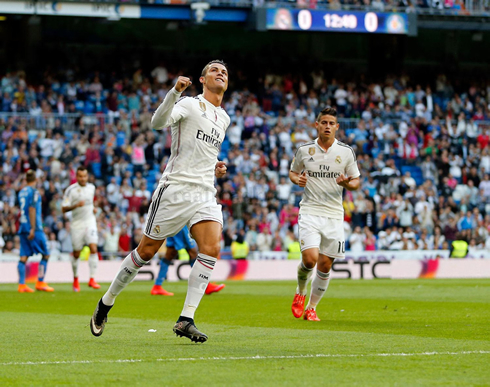 Real Madrid played their last game of the season this Saturday night at the Bernabéu, beating Getafe by 7-3 in another impressive goal fest in the league. Cristiano Ronaldo led his teammates in the first half, by scoring an hat-trick and cementing his first place in the Pichichi race with 48 goals. La Liga may have been a foregone conclusion heading into the final game of the campaign. But the fans at the Bernabéu were at least treated to a goal fest in match day 38 of what will ultimately go down as a disappointing campaign. There were ten goals in total (seven for Madrid), in what turned out to be a surprisingly exciting end to the season. Cristiano Ronaldo netted yet another hattrick in only 34 minutes as well, and Madrid fans were also treated to the debut of Martin Odegaard, the 16-year-old Norwegian starlet, who became the youngest player to play ever be in the lineup for Real Madrid. For Ronaldo, who finished the season with 48 goals in La Liga and just two behind Lionel Messi's record of 50, it was his 8th hattrick of the season and he'll finish the year as the Pichichi winner. The first goal, in what would be an evening full of them, happened just 13 minutes in. 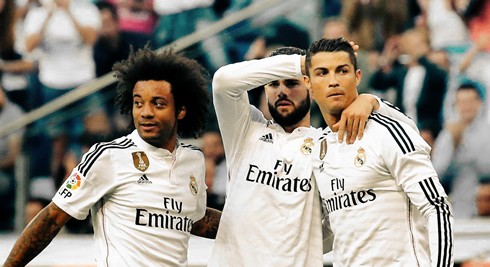 A cross was swung in from the left flank by Marcelo and Ronaldo rose to bury it into the back of the net. Just 10 minutes later however, Getafe would be level. Lax defending from Real Madrid allowed Escudero to rifle a low hard shot into the corner of Casillas' net. The veteran goalkeeper had no chance. And Casillas would be left helpless again just three minutes later after some more horrific defending outside the box. This time it was Castro curling a right footed shot past the Spanish keeper. Just another piece of some excellent finishing from a Getafe side not known for their ability in front of goal. The Merengues admittedly looked rather hopeless and apathetic about the game at hand. The defense couldn't be bothered to close anyone down. And he'd make it a hattrick before long. A through ball from Ronaldo to Chicharito Hernandez left the Getafe defense scrambling. Vigaray bundled over the Mexican in the box and the referee naturally pointed to the spot. 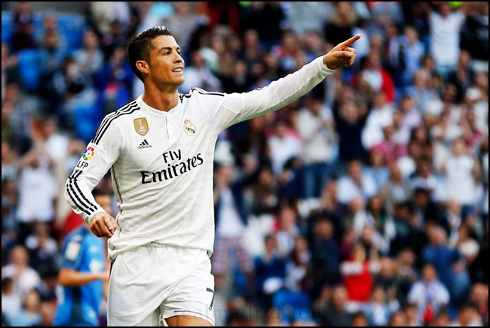 Ronaldo stepped up and buried the penalty for his 61st goal overall and a 34th minute hattrick. Getafe would just keep coming back though. Another example of some poor defending by Real Madrid and a helpless Iker Casillas could only watch again, as Lacen hammered home a shot from inside the box. The Merengues defenders seemed unconcerned with clearing the ball, as both teams headed into the break at 3-3. The goals would keep coming after the break, as Madrid finally got some separation from their city neighbors. In the 47th minute, Chicarito Hernandez buried a close range effort after a Ronaldo header hit the cross bar. And just four minutes after that, it would be another freekick, this time from James Rodriguez, that would make it 5-3. In what could turn out to be an iconic moment, Cristiano Ronaldo was subbed off in the 58th to be replaced by Martin Odegaard, Real Madrid's present and future switching for one another. Jese would make it 6 in the 71st, after some neat one-touch play with James Rodríguez on the outside of the box. A smart finish from the former Castilla man, who's had a rough campaign. Real Madrid would finally wrap it up in the 90th, this time after a goal from the team's left-back Marcelo. An excellent and fast moving counterattack lead to Jesé free with space on the wing. He squared cleanly for Marcelo, who then had an easy tap in in the end to make it 7-3. Madrid now has a summer of reflection and change ahead of next season. There are many questions to be answered, but at least the fans were given something to cheer about today. Attackers: Jesé Rodríguez, Cristiano Ronaldo, Chicharito. Cristiano Ronaldo next game will be for the Portuguese National Team, on the 13th of June of 2015. You can watch Juventus live stream, Armenia vs Portugal, Stoke vs Liverpool, Hull City vs Manchester United, Arsenal vs WBA, and Manchester City vs Southampton, all matches provided from our soccer live section.